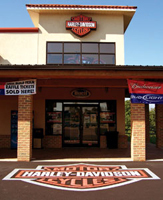 When Dan Miller stood in front of Steve Solomonâ€™s Morgantown, WV, Harley Davidson dealership, he saw possibility. Miller, whose business Miller Maintenance Services, LLC is just down the road in Fairmount, had been called in to do the seal coating on the newly paved 30,000 square foot parking lot. Once the legalities were taken care of, then Flint Trading did its magic. â€œWe took their original artwork, and our design and engineering team utilized computer aided processing to create the full scale design and manufacture the material required for the logo,â€ Flaherty says. Equally careful, Dan Miller and his crew seal coated around the logo. â€œWe taped over the top of it with plastic, and then we were able to seal right over the top of the logo. After it dried, we just pulled the plastic and tape off,â€ Miller explains. However, he did take some added precaution. â€œWhen we do tennis courts and we tape off the lines, we have to use Stripe-Rite.â€ Made by ThorWorks, this product is a milky white acrylic that dries clear. It is used as an emulsion primer for line striping to fill in gaps between the tape and the surface so the contractor can produce razor sharp lines. â€œOnce you put your tape down, you take a paintbrush and go along the edges and put down the Stripe-Rite. When it dries, it dries clear and seals the gap between the tape and the pavement so nothing wicks underneath it. When we put the tape down around the logo, we put Stripe-Rite around it just for added protection. We laid down the plastic over the top of that.â€ It took them four hours to seal coat the parking lot, which was done in the evening. Weeks later, the logo is the talk of Morgantown. â€œThe people I was talking to up there the other day said it was a really nice piece that just set off the building. And the building is a really nice building anyway,â€ says Miller. Flaherty is eager to do more of these decorative markings. â€œWe have been doing more and more of these type of specialty items,â€ he says, mainly for school teams and mascots. But Flaherty is more excited about what can happen when contractors get together and start sharing. â€œIt is just amazing when you go out and work with people, and they start coming up with all kinds of ideas,â€ he says. â€œThere is really not much we cannot do with thermoplastic.â€ Though there are some limitations about how small lettering or detail can be, the possibilities for design and application are endless. Decorative marking is definitely another add-on to improve your bottom line. Plus, it can be a great creative outlet for members of your crew who are looking to do something original or unusual. For more articles from APE Publications go to www.alliedpavingequipment.com.